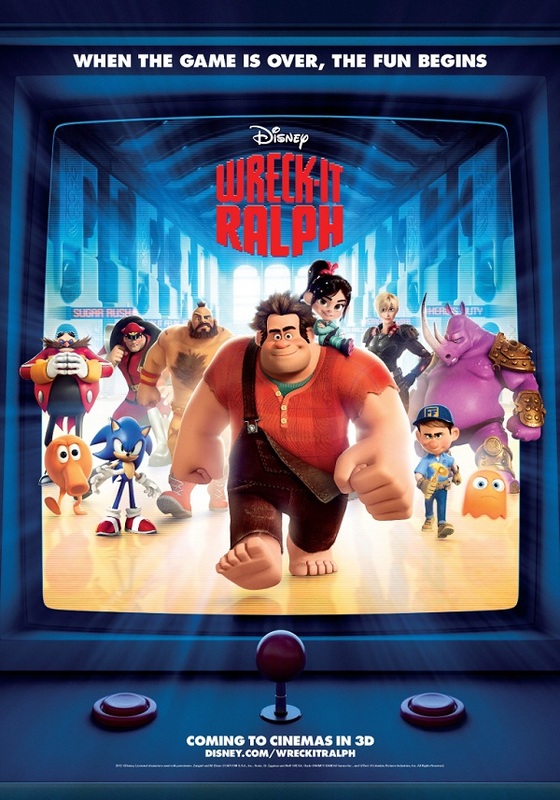 Ralph (voiced by John C. Reilly) is the bad guy in and old school arcade game. Think a hillbilly version of Donkey Kong. He’s fed up with being the bad guy. Fed up with receiving no love or respect from he citizens of his game. So he leaves his game, Fix-It Felix Jr, and goes looking for recognition he longs for in other games, unaware that his actions could result in the equivalent of a video game apocalypse. 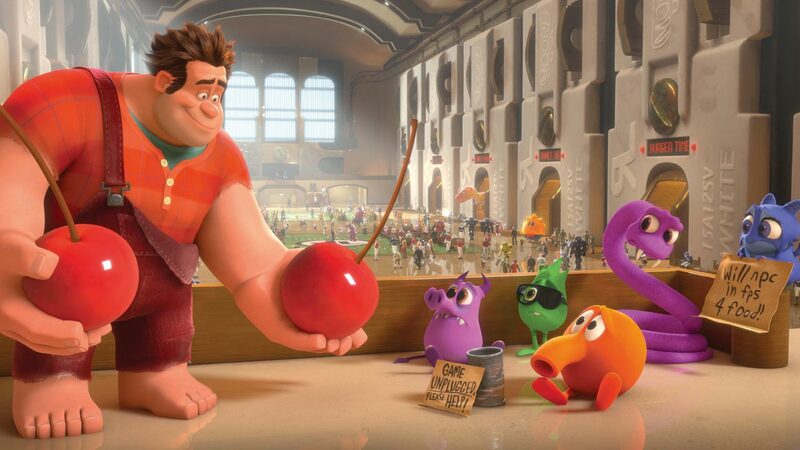 Wreck-It Ralph looks amazing. A lot of care has been taken into producing whole worlds, from the 8-bit world of Fix-It Felix Jr to the hi-res first-person-shooter Hero’s Duty to the diabetes inducing pink wonderland of Sugar Rush. A lot of work has been put into making the worlds of these characters a visual treat. Each character not only has their own personality but they also look and move differently, depending on their game. And having cameo appearances from classic characters such as Pac Man and Sonic the Hedgehog doesn’t hurt either. The story of Wreck-It Ralph is not a new one. Down-trodden lovable loser seeks to show everyone how wrong they are and in the process finds himself embroiled in an adventure far beyond his ability to cope with. What makes it worth watching is a combination of the visuals and the characters. These are characters you want to love. You feel for their losses and you cheer for their wins. The world of this arcade is one I’d gladly return to for a sequel. While there are times the humour skips a little too close to the childish slapstick zone for my liking, I enjoyed this film the whole way through. The treatment of Ralph by the citizens of his game is deplorable. They’ve labeled him the bad guy and treat him as such, even when the arcade closes and it’s time to relax. He’s big and clumsy, but he genuinely wants to be friends with these people. Yet he’s outcast. And when things start to go bad, they blame him for running off, even though they are the ones who caused him to run off. Ralph is an important part of their game and should be cared for and loved just like every other character. The same thing can happen in our churches and youth groups. We can be guilty of labeling Of arbitrarily deciding that someone is not “one of us”. So we push them to the side. We don’t treat them well. We secretly hope that they would just go away. Is that how we should act? Is that how we should treat someone that may well be a fellow child of God? James would say no. In the church he was writing to, they had an issue with people treating the poorer members of the church like dirt and showing favouritism to the rich. This is how he responds “But if you show favouritism, you sin and are convicted by the law as lawbreakers.” (James 2:9) Every church or youth group will have its own Ralph. If we are convicted by the Word of God, by the grace that has been shown to us, then we will go out of our way to include everyone, even if they are big and clumsy and smell bad. Wreck-It Ralph is a lot of fun. Not only did I enjoy it but I would easily watch it again, even if it’s just to catch all the hidden Easter eggs that I missed the first time. Even if you’re not a computer game junkie, there’s a lot to like in this film.